Block Island wind farm, off Rhode Island, finally brings wind power to America’s oceans. There’s no better place than the ocean to generate emissions-free power. Why did it take us so long? A crane hangs over the first jacket support structure installed to support a wind-farm turbine off Block Island, Rhode Island, on July 27, 2015. Wind-generated electricity has become a big business in the United States. From virtually nothing a decade ago, it has boomed to account for about 5 percent of electricity generated each year. In certain states, at certain times, cheap, emission-free wind can account for a huge chunk of supply, as happened recently in Texas. Wind adds capacity in large chunks—a wind farm may consist of scores of turbines arrayed across vast expanses of land. So far this year, according to the Federal Energy Regulatory Commission, nearly 3 gigawatts of wind capacity has come online in the U.S., accounting for 40 percent of all new electricity-generating capacity. But although the U.S. has become a global leader in wind, there’s a subsector in which it’s lagged behind: offshore wind. Around the world, and especially in northern Europe, anchoring wind turbines to the bed of the sea—where the wind is consistent and strong—has become a huge business. Denmark has installed so many offshore wind turbines that it often produces far more wind power than it can actually use. Earlier this week, DONG Energy announced plans to develop the largest offshore wind farm in the world, an 87-turbine site off the coast of Wales with a capacity of 660 megawatts. That’s about the size of a decent coal-fired plant. The U.S. has pursued a different path, in part due to geography. Unlike northern Europe, the U.S. is blessed with vast, open plains areas that are natural homes for wind farms. And the coastal regions of the U.S. are home to its seashore-owning elites who rebel at the prospect of turbines marring their serene views. NIMBYism—by which I mean “Not In My BaY”—has effectively put the kibosh on Cape Wind, a long-planned wind farm developers wanted to build in Nantucket Sound. But now the U.S. is finally building its first offshore wind farm. It’s a small, experimental demonstration project—five turbines with 30 megawatts of capacity, near the southeast coast of Block Island, the preppy redoubt off the shore of Rhode Island. Planning dates back to 2008, and construction of the steel structure that attaches to the ocean floor 90 feet below sea level began earlier this year and should be done this fall. 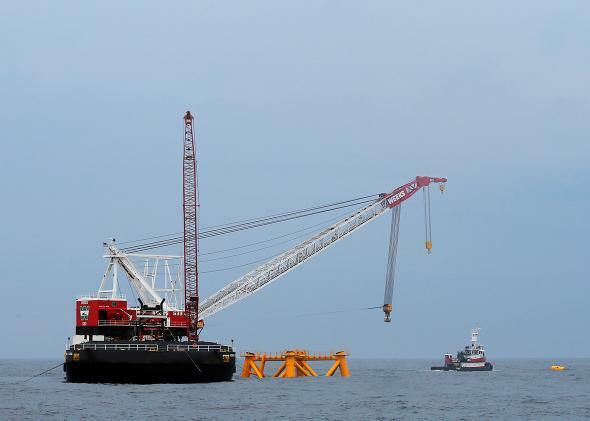 “Next spring when the weather improves, we’ll lay the submarine cable that will support the project,” says Jeff Grybowski, chief executive officer of Deepwater Wind, the company behind the $300 million project. “And in the late summer of 2016 we will erect the turbines and commission them so it can be online in the fourth quarter.” The project is funded by Deepwater Wind’s main owners, the giant hedge fund complex D.E. Shaw, and cash from banks. The owners will benefit from the federal wind production tax credit. So why is the Block Island wind farm happening? Because of its location, the way that location was chosen, and the particular economics surrounding electricity on islands. First, the location. The farm is being constructed 3 miles off the southeast coast of Block Island, which is effectively in the middle of the Atlantic Ocean. The wind there is very strong. But the winds of opposition to the plan have been weak, in part due to the method in which the site was chosen. New power plants are often imposed upon regions by developers. “The site was selected by the state of Rhode Island, and that was a critical distinction,” says Grybowski. Several years ago, Rhode Island zoned the ocean waters under its control and designated this area as a renewable energy zone. While support for the plan wasn’t unanimous, the fact that the community effectively chose the spot “greatly reduced opposition to the project,” says Grybowski. Second, the economics. While the electricity Block Island wind farm produces won’t be cheap by any measure, it will provide economic benefits to Block Island. Electricity on islands that are unconnected to large grids tends to be very pricey, which is Hawaii and Puerto Rico have the most expensive electricity in the U.S. Block Island, which is part of Rhode Island, doesn’t currently have a connection to the mainland. So its utility, the Block Island Power Company, creates electricity by floating diesel tankers across 18 miles of water on the ferry and then burning it in generators. That’s dirty, noisy, and very expensive. During the peak summer season, the utility charges generation fees of 24 cents per kilowatt-hour, which is very high. In essence, the wind farm will displace the diesel generators at about the same price, create new infrastructure, and funnel emissions-free power into Rhode Island’s larger grid. The five giant turbines—the tips of each blade will rise 600 feet from sea level—will feed the power they produce into a cable buried under the seabed that will connect to a newly constructed substation on Block Island. Because it will produce far more than the island can use (Block Island’s peak demand is about 5 megawatts), the company is also building a new cable that, for the first time, will connect Block Island to the mainland. The cable will tie into the infrastructure of National Grid, which serves a big chunk of New England, allowing for electricity to move in both directions. Deepwater Wind has inked a 20-year power purchase agreement with National Grid to sell the power, starting at 24 cents a kilowatt-hour. Grybowski says it makes sense to build wind turbines offshore, even though the degree of difficulty is greater. Because the wind is generally much stronger on the ocean (it encounters few obstacles), developers can use larger turbines, which spin more rapidly and efficiently. Also, while onshore wind tends to be most powerful at night, when electricity demand is low, offshore wind turbines tend to produce their greatest output in the late afternoon and early evening—precisely when demand is spiking. And, if coastal states in New England and the mid-Atlantic want to add meaningfully to the supply of emissions-free energy, offshore wind is the only possibility. The land just isn’t available for solar and wind farms. But it could be a while before we see anything beyond this demonstration project. The federal government, which controls the continental shelf beyond state waters, has designated offshore areas for wind production and auctioned off sites. And many states are developing plans. Deepwater Wind has won two development sites—in a chunk of ocean equidistant between Martha’s Vineyard and Block Island, and 20 miles off the coast of New Jersey—where it hopes to build massive wind farms. But none of those is close to construction.